Time to show us what you got. When you take time to meander through the halls of SparkFun's headquarters in Boulder, CO, you see robots tucked into corners, office walls wired with copper tape, and a T-Rex taking up perfectly good office space next to a giant Nintendo controller on the second floor. Behind the desks full of assembled LEGO Star Wars sets and skateboards leaning up against the wall, and past a roaming robot that offers pretzels to passersby, you begin to see signs of SparkFun's most favorite pastime: the Autonomous Vehicle Competition. 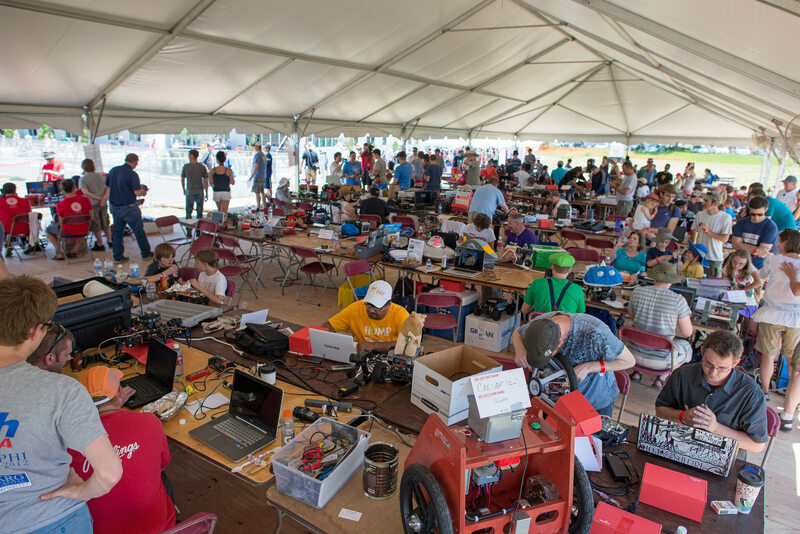 For those SparkFun veterans out there, our active community members and repeat customers, AVC is a familiar event. But for someone like me – someone new to SparkFun and new to the maker movement – AVC represents everything exciting about discovering what the heart and soul of SparkFun is. In the short time that I've been part of SparkFun, I've interviewed our staff members and former AVC competitors, and talked with fans – not just to understand what AVC is, but why we host it year after year. The answer has been overwhelmingly clear: AVC is our time to celebrate. It's SparkFun's chance to throw open our doors and welcome our community for a day, enjoy each other's ingenuity and our shared support for open source values, and together test how far we can push the limits of technology right in our own backyard. We all know that the best feeling in the world is the thrill of making something work. But for SparkFun, having the privilege of supporting that experience for our customers through our products, tutorials and projects is what we love most. Here, you see AVC everywhere. You see old posters pinned up on the walls, beat up vehicles sitting on shelves like trophies, and staff wearing AVC T-shirts every day of the year. 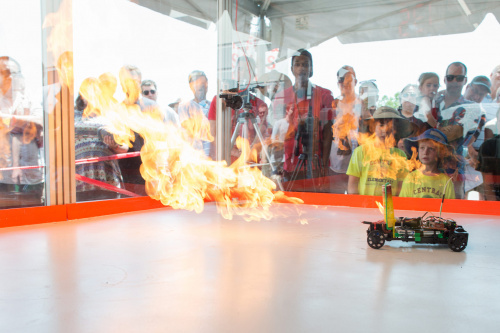 Out of the 40+ events that SparkFun will participate in this year, nothing is more exciting to us than this September’s AVC. 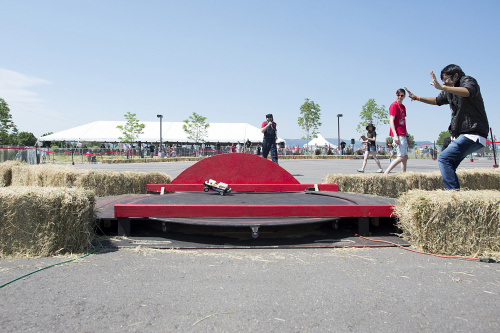 The heart and soul of SparkFun and the heart and soul of AVC are one and the same: our constantly innovating community that shows us every day just how far we can push the boundaries of making and inventing. 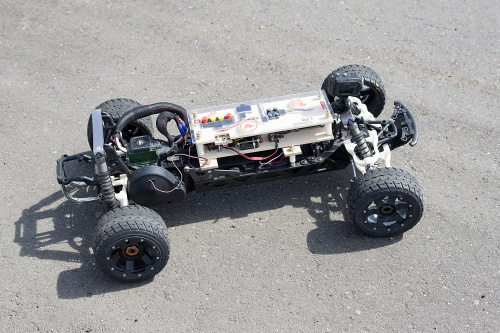 Build your own autonomous vehicle weighing under 25 pounds that can jump ramps, make right turns AND left turns, and self-navigate a squiggly course. Get a Power Wheels vehicle from a friend, or find one Dumpster diving. Swap out a battery (or three) and get that chassis rolling! Human driven, these vehicles are put to the test in multi-lap group races. Bring your costume and a fun hacker attitude. Combination AVC and PRS. Bonus points if you put a gullible human on board an autonomous, souped-up Power Wheels vehicle. Bring your one- or three-pound fighting robots (antweight and beetleweight) for a fight to the death (or at least until time runs out). The fight for robotic dominance continues. Who do we contact with rules questions? I want to see an off-road track/dirt track, and a water coarse (for boats/hovercraft) in the next AVC Also, is there a chance we could have a 360 degree stream? That way anyone can look at what they want without needing to have everyone looking at the same thing at that time.